Pictured from L-R - Kevin Guillen, the director of the AV Hispanic Chamber of Commerce and Co-chair or the AVHCC Economic Development, Dr. Guillen and Senator Wilk. 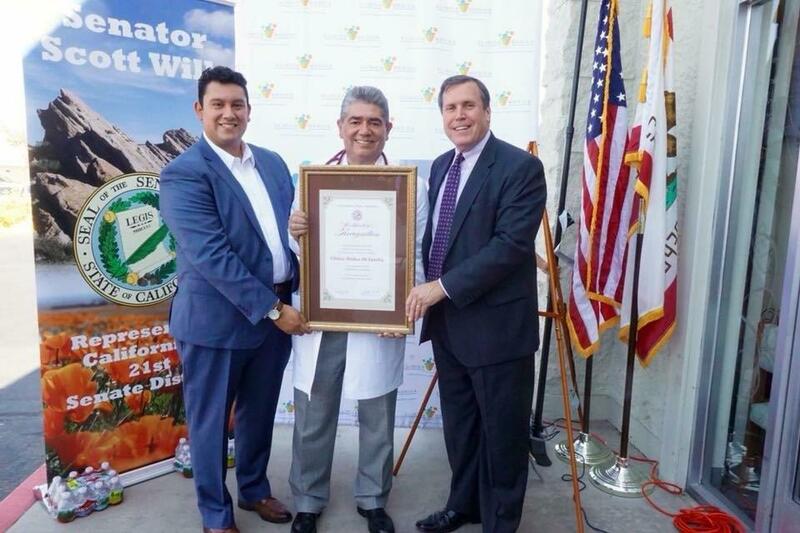 Sacramento –Senator Scott Wilk, R-Santa Clarita, honored Clínica Médica Mi Familia as September’s 21st Senate District Small Business of the Month. Senator Wilk presented the award to owners Roberto Guillen, PA C and Carlos Martinez, MD Joining in today’s celebration were co-workers, patients, fellow business community members and elected officials. Clínica Médica Mi Familia was founded in 2011 and has been involved in numerous community activities related to health care including health focused radio programming, local health fairs, senior citizen community, and education. Their generosity extends well beyond taking excellent care of their patients. Clínica Médica Mi Familia offers free, reduced cost health screenings, bilingual services, education and work with the local business community. A primary focus has been providing a place where Spanish speaking families can interact with specialists and health organizations working on health issues affecting the Latino Community. “September is Hispanic Heritage Month and honoring a business that is Latino owned, committed to addressing the needs of our Spanish speaking community and works so hard for the betterment of all of us in the Antelope Valley is a great pleasure,” said Wilk. “Congratulations to Roberto Guillen, Carlos Martinez, and the team at Clínica Médica Mi Familia for a job well-done. You are very deserving of this recognition.